The talk around the water cooler at work the other day focused on TV media players. 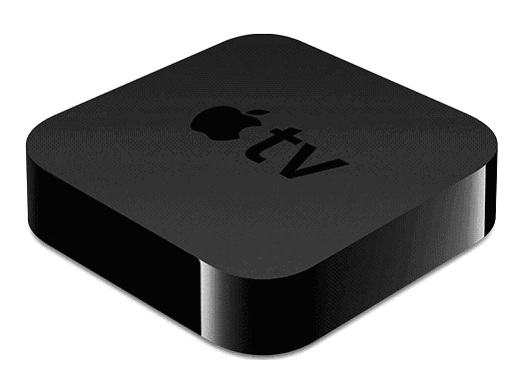 A colleague recently purchased one, which got others who already had HD media players to express their love of them, but wishing they could add more capacity to do additional functions, like gaming. One of the IT folks happened to be passing by and overhead the conversation. He casually said, “Why not just build your own?” He enlightened us to form factor or barebone systems that allow people, even those who know nothing about electronics, to build their own media player.That evening, I decided to do some online research into these barebone systems and discovered that there are quite a few products on the market today that offer the ability to build your own HD media player. 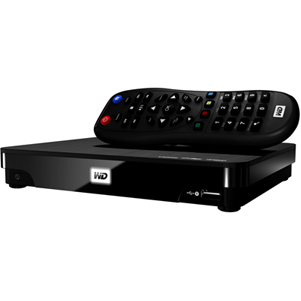 I also found that you can build much more than a media box with these form factors. You can actually build a home theater PC that handles all types of functions, like media streaming, viewing, media storage or organizing, gaming and even computing.The next day at work, I asked the IT guy about some recommendations of good barebone systems. Among the ones he mentioned was the Cooler Master Elite 120 Advanced mini-ITX computer case. He liked the size, especially for beginner level builders, the design of the different bays, the quality of the housing, the included fan for cooling and the price for the value. I decided to look further into his recommendation and found that it was the perfect match for me as a gaming unit and media player. If building electronics isn’t exactly your thing, Cooler Master has provided lots of resources that support its Elite 120. 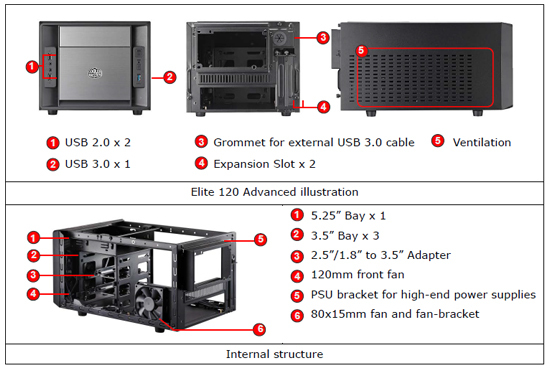 Before you begin customizing your form factor media player PC, I definitely recommend reading the installation guide that is included in the packaging or available online (http://www.coolermaster-usa.com/upload/download/355/files/Elite%20120%20Advanced%20-%20Manual.pdf). You especially need to be sure the connectors of the motherboard you are installing match up with the front panel cables of the Cooler Master case. You should also plan out your cable routing by identifying the locations of cable holes and bridges before installing system components. 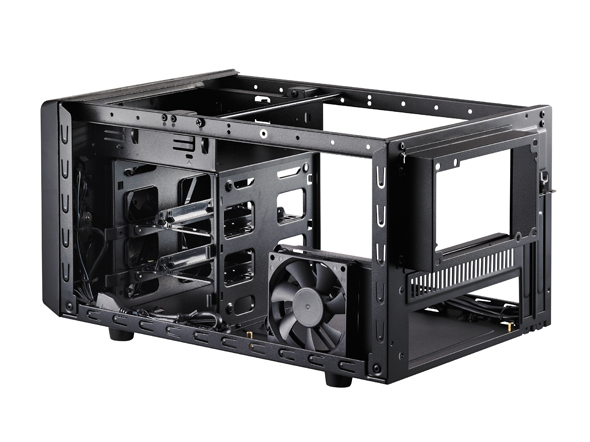 A smart addition to the chassis is the cable management path along the top frame for hiding the cables.When beginning your customized build, you first need to remove the top case cover to expose the interior. The installation guide does a really good job guiding you through equipping the Elite 120 Advanced to meet your desired functions. Not knowing very much about the innards of computers or electronics, I found the visual pictures in the guide extremely helpful. The step-by-step drawings show you how to install the 5.25-inch drive, case fans, the motherboard, add-on cards, the power supply and hard disk drive, and how to complete installation by closing up the box.Building your media player or home entertainment center is really just a matter of installing the necessary components in the slots and spaces provided within the chassis. If you want to install an optical drive, you’ll find housing for it on the front of the panel. If you need help, I found the Elite 120 Advanced Overview with Steve and Steve and the Elite 120 Advanced How-To System Installation videos on the Cooler Master website (http://www.coolermaster-usa.com/product.php?product_id=3102&product_name=Elite%20120%20Advanced) very helpful. One advantage to building your own media player is that you can make use of components in devices that you are no longer using. For instance, if you updated your computer with a new one, you can use the power supply, motherboard, video card, or other components from it to equip your home theater PC (HTPC) and save some money in buying the needed components. Once you finish installing components in the Cooler Master Elite to perform whatever media or computing needs you choose, plug it in and press the on/off button found on the front panel. Also on the front panel is the reset button, headset and microphone jacks, and USB ports. 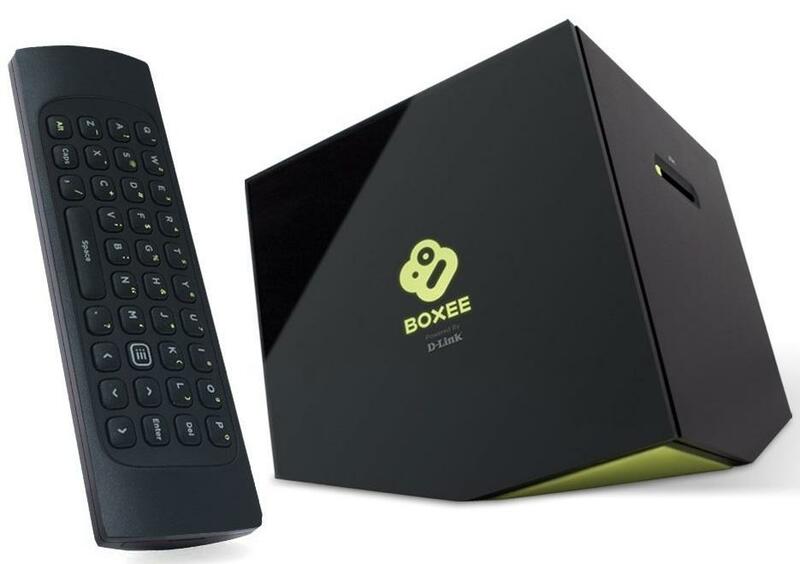 What’s great about building your own TV media player is that you can use it for whatever function(s) you actually need and equip it with the capability and power you need for these functions. For example, I have a lot of videos, music and photo files stored on numerous external drives, so when I built my media player, I equipped it with more storage potential.These types of form factor units can be built to your own specifications. If you want a combined media player and PC, you can build that. 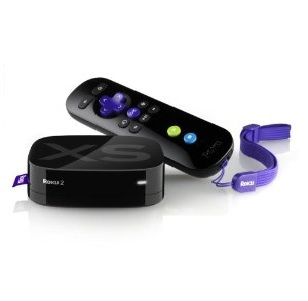 If you want a media streamer and storage, you can customize it that way. If you want something for gaming, you can install the required components to create it. With just the chassis, you really have the freedom to decide how you want to use the device and build it accordingly. Plus, if your needs change down the road, you can uninstall components and rebuild it. In general, the components you’re going to need to utilize your media device to its fullest are a motherboard, a processor, a CPU cooler, a hard drive, RAM memory, a video card and a power supply. If you plan to use the 120 Elite as a computer as well, you’ll also need to add an operating system. 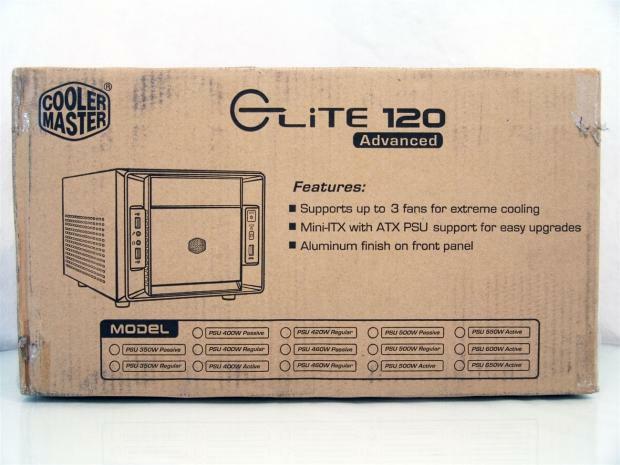 The Elite 120 mini-ITX is manufactured by Cooler Master, a leading creator and manufacturer of desktop components, enclosures, peripherals, power supplies, cooling products and more. The Elite 120 Advanced comes with two front panel options: aluminum and plastic, or mesh. The case body is steel alloy. 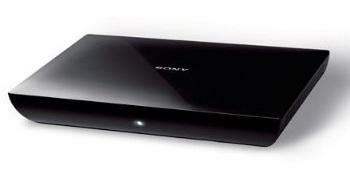 The chassis measures 15.8 inches in length, 8.2 inches wide and 9.4 inches in height and weighs 7.3 pounds. The Elite HTPC comes equipped with one 5.25-inch drive bay and three 3.5-inch drive bays, or you can convert two 3.5-inch bays into four 2.5-inch bays. The I/O panel supports one USB 3.0, two USB 2.0 and audio in and out. There are two expansion slots. The M/B type is a mini-ITX. 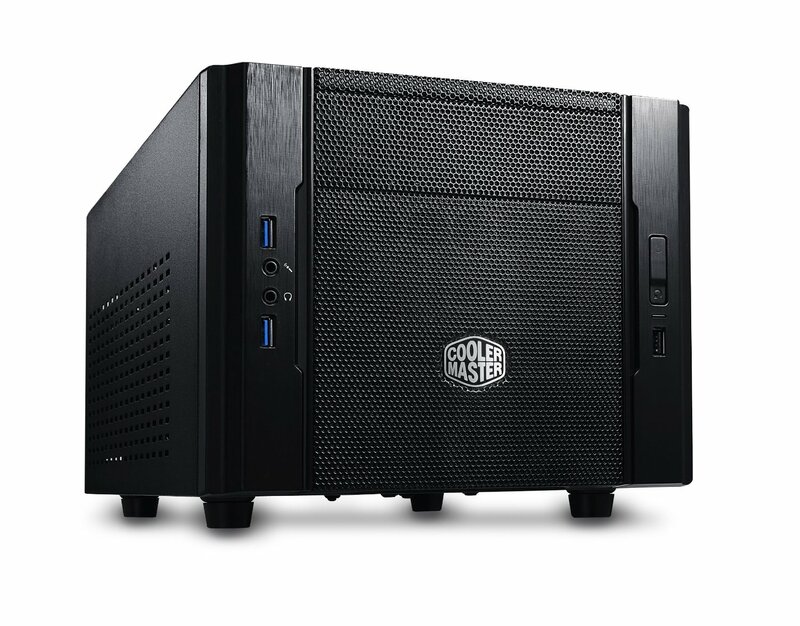 The Cooler Master Elite 120 Advanced – Mini-ITX computer case also has long graphics card support, with 13.5 inches the maximum compatibility for the VGA card length. The cooling system supports one 120mm fan in the front with 1200RPM, one 8015mm fan on the side with 2000RPM and one optional HDD fan of 12025mm. Maximum compatibility for the CPU cooler height is 2.5 inches. The power supply is the standard ATX PS2. The Elite 120 Advanced offers several features that typically aren’t found in other barebone systems, particularly small-sized ones. Right off the bat, I noticed how compact the chassis is, yet it supports full-size desktop components. I would say it’s about 1/3 the size of a standard case. It actually supports full-size ATX PSUs, large, high-end VGAs, a 5.25-inch optical drive, a full size 5.25-inch drive bay and up to five HDDs or SSDs, which is unusual for a case this compact. But if you’re looking to build a gaming system, this enclosure will serve you well.I also found the airflow system rather extensive for a mini-ITX enclosure, offering three fans and a large venting area. Despite this large airflow system, it still runs quietly and keeps the system adequately cooled.The Cooler Master Elite 120 Advanced was created as an attractive space saver and its clever design accommodates full features, so you get the best of both worlds with this product. One Chassis, which comes with a removable 80mm fan and fan bracket. One Fittings Pack that includes the following hardware for securing the components you add to the chassis: four stand-off screws for the M/B tray and a stand-off socket for affixing them; eight #6 screws for the M/B tray and PSU; 20 #5 screws for the ODD and 2.5-inch/1.8-inch HDD; 10 cable ties; two HDD tool frees for the 3.5-inch HDD; 1 buzzer for the motherboard speaker; and four rivets for the fan. The Cooler Master Elite 120 Advanced retails for $59.98, but you’ll find prices ranging from as high as $69.00, not including shipping, to as low as $44.99 with free shipping. I suggest you do some price comparisons online before purchasing because you might come across a sale. If not, Amazon, which always has the best prices around as far as I’m concerned, has the Elite 120 as its regular price for $49.99, plus shipping is free. Most buyers of the Cooler Master Elite 120 speak favorably about the unit. Its size and design, in particular, are getting a lot of comments. It reminds people of a microwave, a computer split in half, or a personal safe. 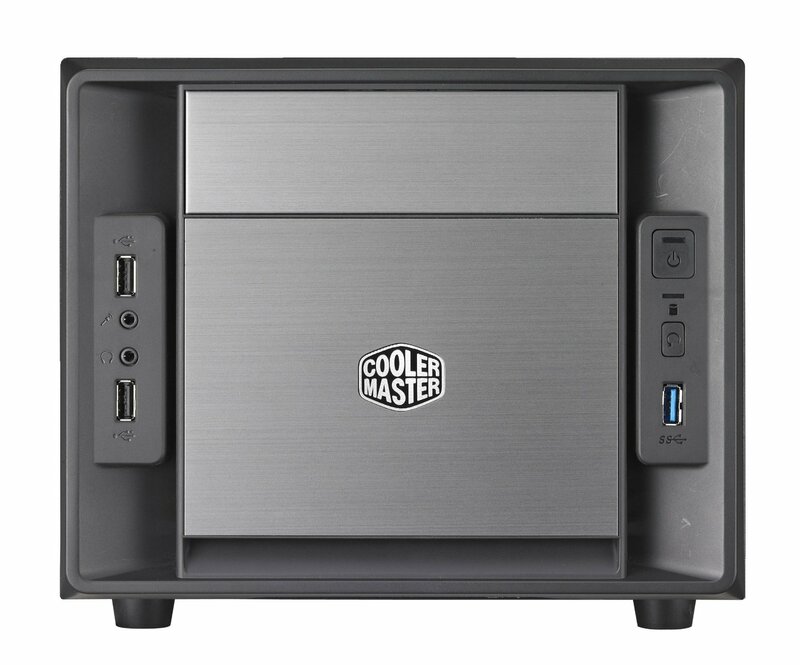 However, the look of the box is what allows people to build the home theater PC of their dreams without having to worry about cramming components in or not fitting wires or managing cables.Some issues a few users encountered with the Cooler Master mini-ITX pertained to airflow problems. It appears they tried to install cooling fans that were too big for the unit to support or a big GPU that was not installed properly to vent out the back of the case. But those who had airflow problems also applauded Cooler Master for designing a box with plenty of vents for discharging hot air. You can purchases the Elite 120 media box directly from the Cooler Master store (http://www.cmstore-usa.com/elite-120-advanced-steel-alloy-mini-itx-tower/), but you need to open an account before you can view the selling price. The Cooler Master website (http://www.coolermaster-usa.com/product.php?product_id=3102&product_name=Elite%20120%20Advanced) also includes a Where to Buy section where you can use an interactive map to find resellers in your particular area. Among them are: CompUSA, J&R, Micro Center, Computer Central, Computer Sonics, Computer Geeks, Fry’s Electronics, Software & More, and SuperBiiz.The Where to Buy section also lists online stores that carry the Elite Advanced series, among them Amazon, Newegg, TigerDirect, Walmart.com, 3DCool.com, Electronic Inventory Online, GamerKnight.com and DirectTron.com, just to name a few. There is a review section on the Cooler Master website (http://www.coolermaster-usa.com/product.php?product_id=3102&product_name=Elite%20120%20Advanced), but keep in mind that these are written by professional reviewers, not consumers who actually purchased the item. Some of these reviewers may have gotten the Elite 120 for free from Cooler Master in exchange for a review, so the reviews might not be impartial.If you’re looking for reviews from actual consumers who purchased the product, I would use Amazon.com. Here you’re getting actual experiences of regular people who built an HTPC using the Elite 120 enclosure and the issues they may have encountered. You can also check the online stores that sell the Cooler Master 120 Elite. Often times, they have a section for customer reviews.